Most persons with paralysis or missing limbs found manual transmission vehicles difficult if not impossible to operate. If one’s legs were missing or paralyzed, driving had to be done with hand controls. Early versions of hand controls consisted of various levers with mechanical linkages to the gas, brake, and clutch pedals. Hand controls of the 1930s and 1940s were not user-friendly and were dangerous to operate. Driving an automobile with a manual transmission entirely by hand meant juggling levers for clutch, brake, and throttle with one hand while steering with the other. Some innovative designs combined brakes and clutch on one lever, allowing clutching alone or brake and clutch simultaneously. Drivers were left with no means of operating brakes and clutch independently, so there was no way to ease off the brakes slowly while starting on a hill. Most disabled persons could not access automobility, but for individuals who possessed considerable financial resources, some innovative but expensive solutions were developed to solve this problem. Stricken with polio at age 39 Franklin Delano Roosevelt sought out adaptive mobility equipment to drive without the use of his legs. 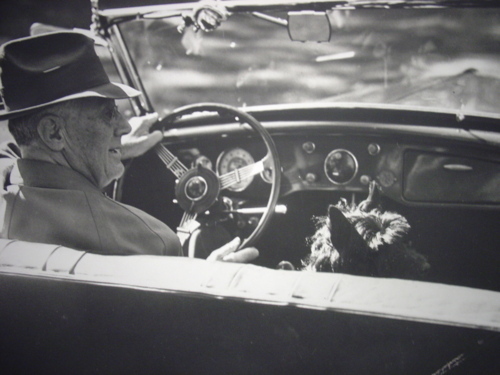 Unlike many in his social strata who preferred to be chauffeured, Roosevelt loved to drive at high speeds in open cars. He owned several cars modified to be driven completely by hand. His Plymouth PA and 1933 DeSoto were both equipped with innovative solutions for shifting gears despite their manual transmissions. In 1933, DeSoto delivered a convertible sedan to President Roosevelt at the White House. 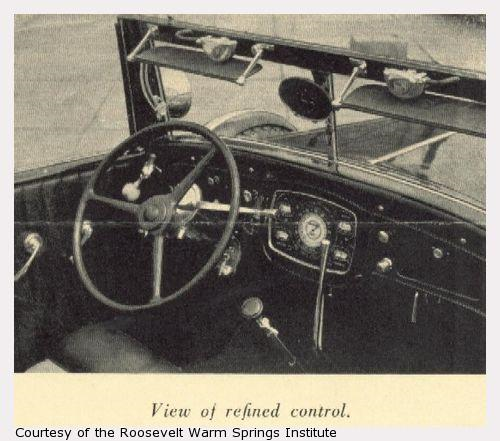 The car was outfitted with special hand controls that enabled Roosevelt to drive without using his legs. DeSoto did not alter other factory-installed controls except removing the gas pedal. The clutch and brake were left intact for the convenience of drivers accustomed to conventional controls. An innovative centrifugal clutch mechanism used flying weights similar to those on a governor to engage or disengage the clutch as the speed of the engine varied. A starter button on the dashboard was installed, replacing the DeSoto standard automatic foot throttle starter. When the button was pressed, the engine started and was given the proper amount of gas to keep the engine running just below the threshold of engaging the centrifugal clutch. A trigger mounted just below the gear shifter knob was raised to accelerate the engine and engage the clutch. Once the car reached sufficient velocity, the trigger would be dropped to slow the engine, disengage the clutch, and shift into a higher gear. The throttle pedal was replaced with a lever enabling the right hand to control gas and braking. When the lever was raised from its central position, throttle was increased. Lowering the lever below its central position applied a four-wheel vacuum assisted braking system. An extension lever modified the emergency brake, which operated the same braking system as the gas and brake lever. A parking brake underneath the cowl on the right side of the instrument panel operated a brake band on the drive shaft directly behind the transmission. This customized arrangement allowed steering with the left hand while the right hand could perform other necessary tasks. Roosevelt kept a Plymouth PA phaeton at his Little White House in Warm Springs, Georgia. Records of how he acquired the auto have been lost, so it is unclear when he purchased it and whether it was bought new or used. The Stone Controls Company of Summit, New Jersey outfitted the Plymouth with an innovative hand control system developed by Mr. M. McIntyre. 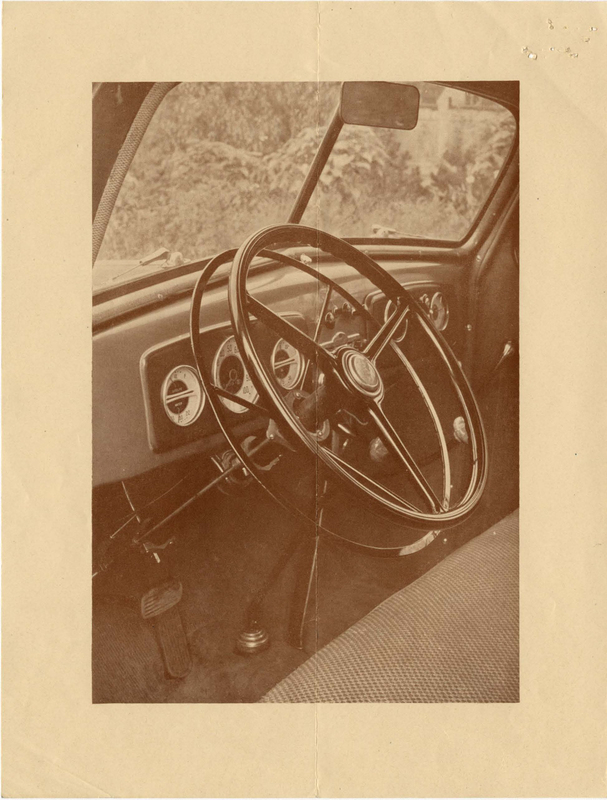 The Stone Controls system incorporated full power brakes, throttle, and clutch into a single control wheel mounted on the steering column just below the steering wheel. It freely rotated around the column so it could be grasped along with the steering wheel. Valves controlled by the wheel operated vacuum cylinders that manipulated the brakes, throttle, and clutch. When in its neutral position about two inches below the steering wheel, the car idled, the clutch was disengaged, the throttle closed, and the brakes were off. Moving the wheel down the steering column engaged the clutch and opened the throttle with increased acceleration when pressed farther down. Any motion upwards from the neutral position applied the brakes. With the vacuum cylinders assisting the driver, one effortless motion was used to slow or stop because upward motion disengaged the clutch, closed the throttle, and then applied the brakes. Two pages from the Stone Control catalogue. 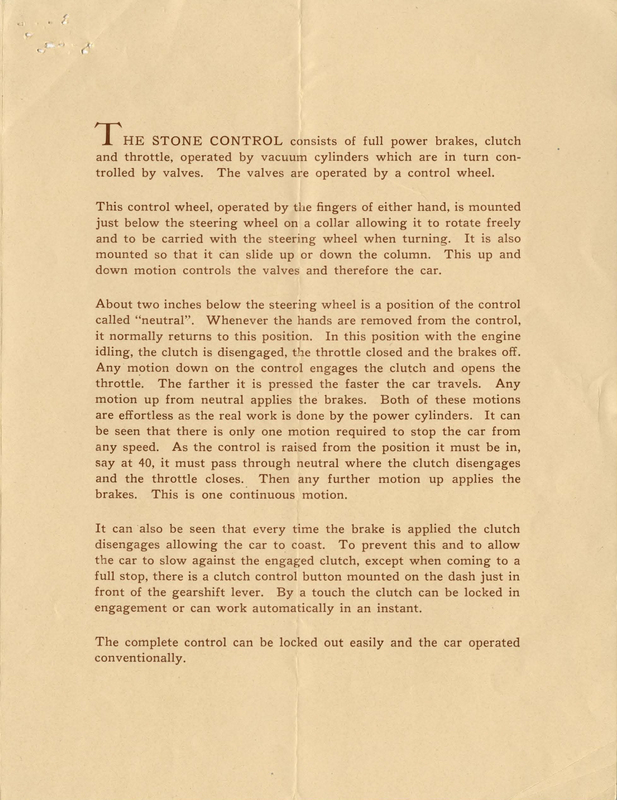 One page depicts the dual-wheel system made by Stone Controls Inc. of Summit, New Jersey while the second page explains how it operates. During the interwar years and post-World War II era, social networks emerged in the disabled community and disseminated information about adaptive technology through word of mouth and publications such as The Polio Chronicle, Toomey J Gazette, and Paraplegia News. President Roosevelt’s White House also participated in this process. The FDR Presidential Library and Museum has archived collections of letters and documents demonstrating that Roosevelt and his secretary fielded inquiries about the President’s driving controls and distributed information about devices such as the Stone Control. In an era when the fields of vocational rehabilitation and adaptive technology were just emerging, this type of information sharing was crucial for empowering disabled Americans with adaptive technology and automobility. Colonel Edward H. R. Green in his electric car at his Round Hill estate. In the first decades of the twentieth century, electric cars offered an alternative to manual transmission gasoline automobiles for those who could afford the high price and tolerate limited range. Edward Howland Robinson Green—known as Colonel Ned Green after a Texas governor made him an honorary Colonel—was the son of Hetty Green, who was widely known as a ruthless Wall Street tycoon and one of the wealthiest women in America. As a young boy, Ned injured his leg in a sledding accident. His mother's renowned miserliness knew no limits, and her refusal to get Ned proper medical attention while seeking free treatment led to the amputation of his leg. As an adult, Green was highly interested in electrification; he became a stockholder in General Electric and funded a variety of experiments, including gas-electric hybrid automobiles. He drove a custom-made electric buggy around his estate but was always determined to drive gasoline cars. Green used his position as a major stakeholder in General Electric to work on the conversion of a manual transmission car to electric drive while keeping the internal combustion engine. Using more than $1,000,000 dollars of his own money, the Colonel's first conversion was a 1929 Stearns-Knight M 6-80 cabriolet. Immediately after the car's delivery, he ordered a second prototype with a Stearns-Knight chassis and high-topped brougham body that resembled the old Rauch and Lang electric coaches. After these first two prototypes, the Colonel had a third car built with future production in mind. A conventional 1929 Stearns-Knight M6-80 sedan with motor number M3133 was converted to a gasoline-electric hybrid by using a GE dynamo bolted to the bell housing of the Stearns-Knight six-cylinder sleeve valve engine in place of the clutch and transmission. 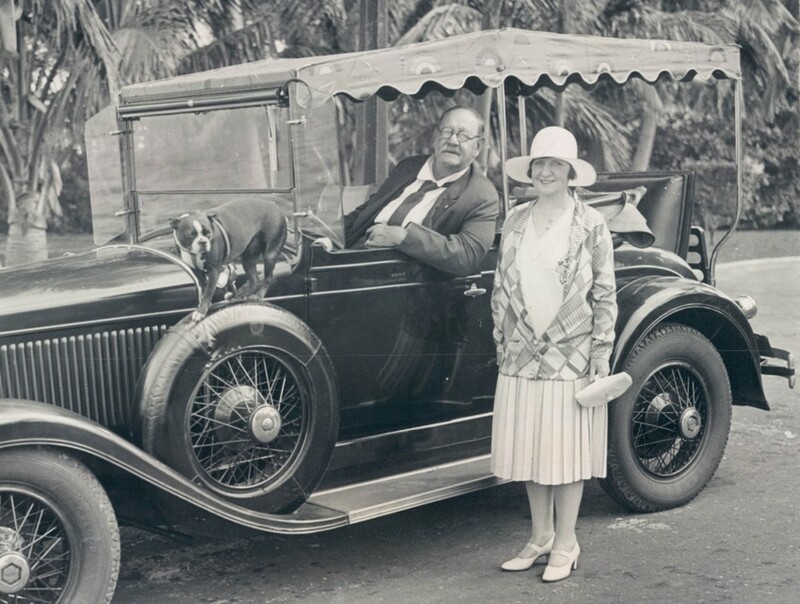 Colonel Ned Green, his wife Mabel, and their dog pose with their electric car. A GE electric motor was mounted on the front of the rear axle, replacing the drive shaft. Propulsion worked simply by using the internal combustion engine to power the dynamo, which employed a system of GE controls supplying electrical power to the motor. 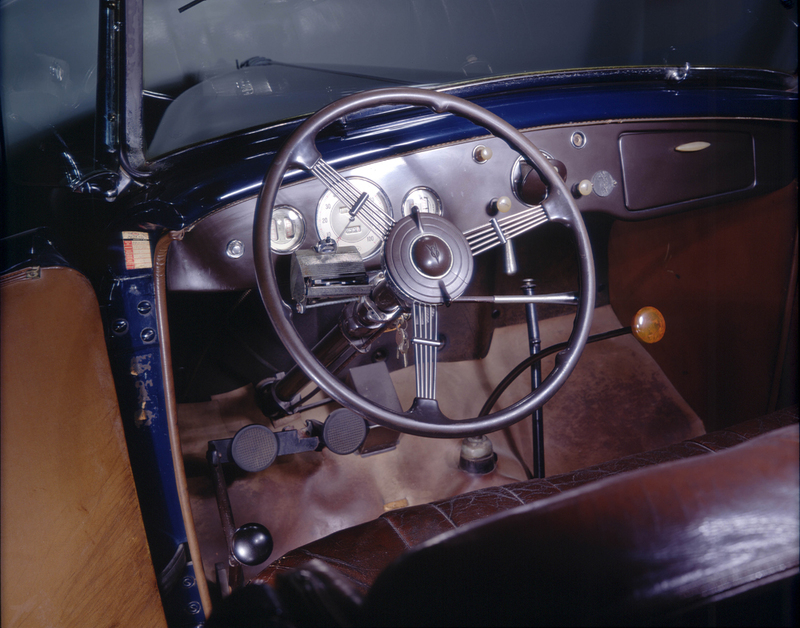 Aside from the throttle and brake pedals, the only other controls for operating the car was a push-pull knob that selected neutral, reverse, and two forward speeds. Because electric vehicles have no need for transmissions, Green could easily drive by operating the gas and brake pedals with his one leg. The system of GE controls processed the dynamo’s power in such a way to provide an infinite range of speeds without clutching or shifting gears. Initially the car’s acceleration was sluggish due to the added 130-pound weight of the dynamo. The final gearing was reduced to increase acceleration, and that limited top speed to 50 miles per hour. The stock market crash and ensuing Great Depression ended plans for future production of these gasoline electric hybrids. Stearns-Knight production ceased in 1929, ending the chassis supply. After obtaining his three cars, the Colonel was no longer interested in funding Rauch and Lang. 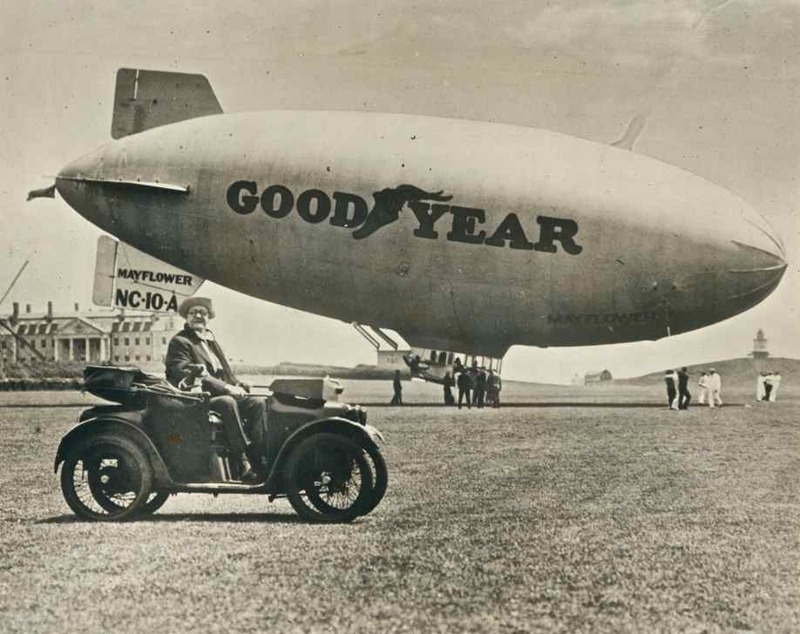 The company soon went out of business, ending this early experiment with gasoline hybrids. The high cost of electric cars, and unique autos like President Roosevelt’s cars and Green's hybrids, meant they were never a viable option for most disabled persons who could not operate a manual transmission. Those drivers would have to wait for a more cost-effective option. The automatic transmission, which was not intended as an assistive device for disabled drivers, provided the solution. The automatic transmission was the most significant automotive invention of the twentieth century for increased accessibility and ease of use for everyone. It was extremely significant for disabled drivers because it empowered many who physically could not operate manual transmissions. Freed from manually clutching and switching gears, individuals with missing limbs, paralysis, and mobility limitations could drive. This invention helped to empower many disabled individuals with the ability to drive to work, run daily errands, and enjoy leisurely drives for recreation. General Motors’ Oldsmobile Division pioneered automatic transmissions. Earl Thompson first created the Automatic Safety Transmission, which was partially automatic and used an innovative hydraulic system to initiate gear changes. Thomas then developed the technology into the Hydramatic transmission with a fluid drive style fluid coupling. Initially the technology was developed for military vehicles but was soon offered in production automobiles for consumers. The first Oldsmobile cars equipped with Hydramatic transmission rolled off the assembly line for the 1940 model year. This was not the first automatically shifting transmission, but it was a major advancement of the technology because it was reliable and affordable.